Increase Market Share and Offer Customers More Choices with New Color Pallets. Train your Team to produce rich multi-step finishes using standard steps in Finish Genius automation to create custom colors. Teach your team how to use standard processes to efficiently produce color matches. This package is an excellent way to create new color palettes and provide an automated turn-key record keeping and process validation system. This package provides the ultimate solution for multi-step training, reinforces color matching skills, and provides the tools to keep the finishing department on track. 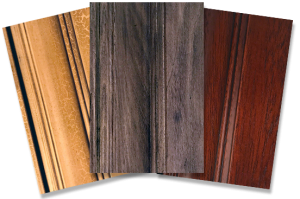 Increase sales and market share by offering larger color palette with beautiful finishes. 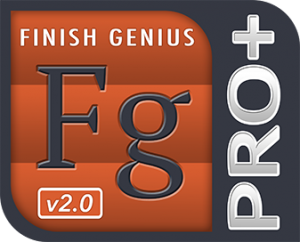 Get Finish Genius Pro+ Populated with new Finish Data. Includes scan barcoded formulas, materials, process schedules, and checklists from custom colors into Finish Genius. Setup and ready to use in Finish Genius Pro+. Supply 150 sample blocks in wood species of your choice. Materials used in this package are selected by company. Produce custom colors on showroom and/or production sample blocks. See Sample Blocks below. On-Site or Consortium Based. This solution package comes with 5 consecutive days of on-site color development, engineering, and multi-step finishing training with Finish Genius Pro+. 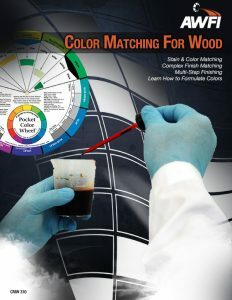 View Color Matching for Wood Course to get an idea of what to expect. • Program is delivered on-site at the manufacturer’s finishing facility. • Pre-visit consultation will be scheduled to discuss coating materials, formulations, equipment, and wood species required. • Finish Genius Pro+ will be setup based on the type of manufacturer, desired market share, and production capabilities. • On-site, the AWFI training technician will create simple formulas using gram weight measurements. The master schedules will be configured and setup in Finish Genius Pro+. All steps and materials will be bar-coded and labeled to provide automatic scanning and uploading to Finish Genius Pro+ with process step data and completed finishing processes. The master steps and finishing processes automatically generate process checklists and dashboard data for each individual color. All finishing processes and electronic checklists can be dynamically edited by the user at any time. Each trainee will learn all process data and technique for each step. The trainer will offer color recommendations and suggestions to create beautiful samples on the purchased sample blocks. The turn-key Finish Genius Pro+ system will be ready to use with detailed training concluding the event. Great for any sized wood finishing shop who wants to deliver their customers amazing high quality finishes. Learn color theory and how to use different elements to create beautifully stained and painted finishes. 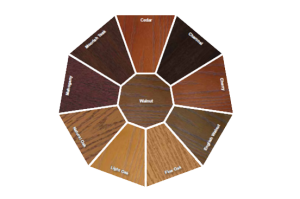 You will learn how to identify various color steps in matching samples and how to build color systems to achieve the advanced multi-step finishes. In a hands-on environment, each class participant will formulate colors for each step to build a complex finishing system from start to finish. Plus Travel & Expenses. Requires 1 year FG Pro+ license agreement. • Includes one set of 150 hardwood sample blocks on your choice of provided wood species. Shared total plus travel and expenses. Requires 1 year Finish Genius Pro+ license agreement of their choice for each company and a finishing facility location to accommodate multiple attendees. Package offered to multiple company attendees for up to a total of 5 with one assistant each. Each company attendee will share same manufacturers line of mutually agreed upon coating materials to create their own custom colors. All colors are proprietary data for each company attendee and uploaded into individual company Finish Genius accounts. Costs for group event is a shared total of $4000 plus expenses. Each set of color blocks for individual company attendee is $500 per set.